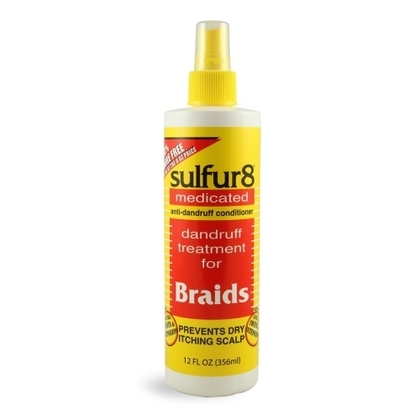 sulfur8 medicated anti-dandruff conditioner dandruff treatment for BRAIDS Prevents Dry Itching Scalp Dandruff control for braids Use Sulfur-8 for softer more comfortable braids. Softens hair and moisturizes scalp. Beautiful braids without the itch. Regular use will allow natural healthy hair growth. Indications: For the relief of dandruff and the dry itching scalp associated with dandruff. Use: Controls scalp itching and flaking due to dandruff. Directions: Spray directly on braids and scalp until wet. Gently massage between braids for immediate relief of itching. Blot with soft towel to remove excess spray. Apply 1-4 times a day, or as directed by a physican. Warning: For external use only. When using this product, do not get into eyes. If contact occurs, rinse eyes thoroughly with water. Stop use and ask a doctor if condition worsens or does not improve after regular use. Keep out of reach of children. If swallowed,get medical help or call a posion control center at once. ACTIVE INGREDIENTS PURPOSE Salicylic Acid, 2%.................Antidandruff INACTIVE INGREDIENTS: WATER, GLYCERIN, TRIETHANOLAMINE, PEG-12 DIMETHICONE, HYRDOLYZED COLLAGEN, DISODIUM EDTA, QUATERNIUM 15, FRAGRANCE.